1) When I turn the key switch and push the pedal, nothing happens. Not even a solenoid click. 2) I have checked the batteries. Each read over 8V and 50V over the whole bank. 3) I have confirmed continuity of the key switch (connected to main pos and pedal with new wires). I have also confirmed continuity across the small terminals on the solenoid. 4) Based on other info I found here, I tried to run jumpers from the main pos and neg of the battery bank to the small terminals on the solenoid. I connected the first jumper from main neg to the solenoid, attached the second jumper to the solenoid, and when I touched the jumper clip to the main pos, it blew the second jumper completely off the solenoid. I'm a bit stumped. Any ideas? You had the polarity reversed. There is a diode on the solenoid. Which is probably shorted now. When you ran the two 48 volt jumpers, you did run them with the 48v Pos to one of the "Small" posts and the 48v Neg to the other "Small" post of the solenoid. So then the two large post did not have any jumpers at all..... Is this correct? Yes, this is correct. I didn't jump the large posts...they remained connected with the 2 gauge wires as-is (Pos to Main Pos/Fuse, Neg to B+ on the controller). Yes, I removed the existing wires to the small posts before connecting the jumpers. The diode was installed backwards. It is destroyed now, order a new one. Thanks Scotty. What makes you think the diode was installed backwards? Here's a pic of how the diode is connected. Then from the pos spade terminal, I have connected 3 wires: the blue wire from the pedal, a wire to the KS1 (red) terminal on the controller, and the positive terminal on the rocker switch. And from the neg spade terminal, I have connected 1 wire: a wire to J1 (blk) on the controller. The picture confirms my suspicion. The banded end is +. See the instruction for diode installation instruction. Replaced the diode and installed with banded end to pos. Still nothing. No solenoid click. What should I check next? 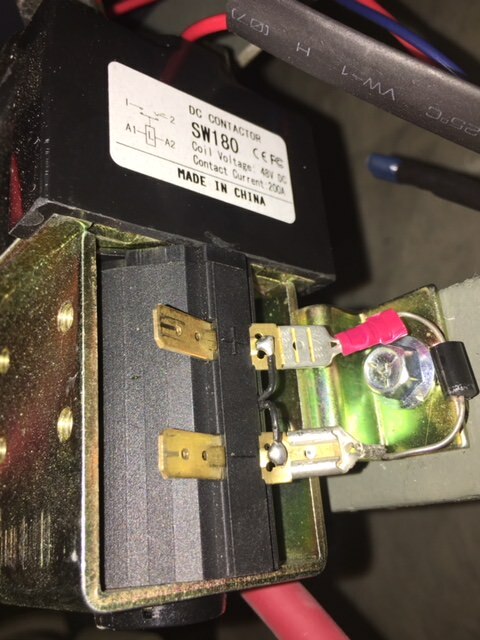 If there is no click, then you are missing the 48v + & - needed for the energizing coil to close in OR if you have them, the solenoid is stuck or has failed.